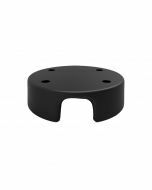 The RAM adapter base includes a 1" diameter rubber ball and inserts directly to the back of Lowrance Elite 4 and Mark-4 Fishfinders. The adapter serves as a quick release mechanism, allowing you to remove or transfer your Fishfinder in seconds. 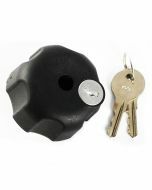 The (RAM-B-202U) RAM marine grade aluminum base contains a 1" diameter rubber ball connected to a flat 2.5" diameter base. This mount has pre-drilled holes, including the universal AMPS hole pattern.